Affordable Adventures fishing in New Brunswick, Labrador, Newfoundland, Quebec Canada - also bear hunting in Canada, outfitters, guides, black bear hunting, bear bow hunting, archery, black powder hunting, big game hunting, B&C, boone & crockett, musket hunting, bear, deer, moose, outfitters, hunt, guides, blackies, moose, moose hunting, accommodations, lodging, guides, atlantic salmon, salmon flyfishing in canada, wilderness, primitive hunting, muzzle loaders, muzzleloader hunting, traditional modern bow hunting archery. Payne River | Tunulik II | Miramichi .. so you'd like to challenge the BIG ones? It all depends on your choice of fishing! Whether you wish to test your fly fishing skills on the King of Fish, the feisty Atlantic Salmon on the world reknown Miramichi in New Brunswick, Giant Brook Trout in Labrador, the best Arctic Char fishing to be found anywhere - in the Ungava Bay area, Lake Trout and Pike in pristine streams and lakes surrounded by virgin forest - whatever your choice, we can offer a package that will create lifelong memories for you! The significant tides in Ungava Bay fill and drain the Payne fiord twice each day. Guides work according to the tidal schedule and know where the fish stack up when tides are lowest. Besides offering non-stop action for Arctic char, in salt water, anglers can explore the fresh waters of the Payne River and fish for Arctic char, lake trout and brook trout from our 24 foot freighter canoes or by wading. Lake trout upriver are not the common breed found in southern areas. They are fast water game fish and the scrappy fight of four to eight pounders and the determined battle of twenty five pound monsters is an extra bonus. The fish are so plentiful at Payne Bay that fly fishermen can experience dynamic action often hooking fish on every cast. Suggested flyfishing equipment includes #8 or #9 weight 9 foot rods, fast sink- ing tip lines and shooting tapers from 150 to 300 grams, with seven to nine foot leaders of eight to twelve pound test. As far as lures are concerned, Arctic char will attack most silvery spoons, but anglers have the best results on the two and three inch Daredevils, Mepps spinners in sizes two and three, and the three-inch Nebco Pixie. The Tunulik II Fishing Camp is located 80 miles east of kuujjuaq (Fort Chimo) on an exposed wind swept granite bluff 50 feet above the north end of lake Tunulliup, a widening (1½ - 3 miles) of the Lagrève River, just 1½ miles inland from Ungava Bay. The river, however, takes a three mile tortuous, twisting course to cover the distance. En route it is filled with rapids and falls that only temporarily slow upriver migrations of sea trout (Anadromous brook trout), Arctic char and the occasional Atlantic salmon. 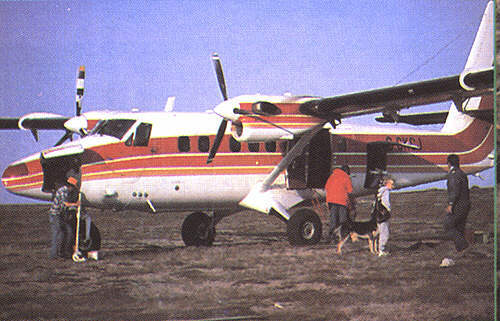 The camp is accessed by Twin Otter on wheels which lands on a natural landing strip behind the camp. This camp only operates for a short period during the migration periods from mid-August to early September. The camp accommodates six anglers who are guided by two Inuit guides. A camp cook prepares three hearty meals each day and a camp manager makes sure all equipment is running smoothly. Although this site operates only three weeks each year, the small camp is well equipped with generated electricity, oil heating, shower facilities, freezers and two way radio communications. The river is small, by Arctic standards, seldom more than one hundred feet wide and usually from two to five feet deep. The steady current in normal water conditions allows anglers with chest waders access to most of the rivers fishable waters. Sea run brookies up to seven pounds, Arctic Char up to twenty pounds and even the occasional Atlantic salmon migrate through these waters each year. Three guests share a guide and they are transported by safe 20 foot freighter canoes powered by 9.9 hp outboard motors. Fly fishermen may find sinking tip lines and higher density shooting tapers very effective when fishing with streamers such as the magog smelt, grey ghost or mickey finn. Dry fly fishing when hatches occur is fast and furious. Spinning with eight to ten pound test line and an assortment of spoons, spinners and brightly coloured plugs will also provide great action. As we are interested in preserving this fishery for years to come, we ask our guests to limit their catch and to practice proper hook and release techniques to increase the chances of survival of the fish they release. New Brunswick's world famous Miramichi River's fame rests primarily on its unmatched ability to produce Atlantic Salmon, the King of game fish. Some 100,000 ranging in size from 1.4 to more than 13 kg (3-30 lb) make their way up the river every summer and fall. 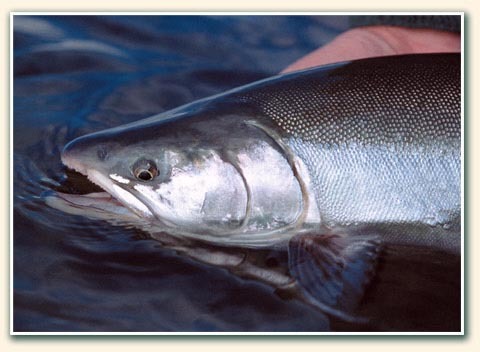 This one river produces nearly one half of all the rod caught salmon in North America. New Brunswick rivers usually yield over 30,000 fish for anglers' flies. For more than a century the Miramichi has attracted the elite of sport fishermen from all over the world. A true sportsman's dream is catching Atlantic Salmon on the Miramichi River. It is just you, the river and the King of Fish. Everything you require is provided. You will be picked up at local major airports (Moncton, Fredericton, Halifax) and transported to our lodge on the banks of the beautiful Main Southwest Miramichi, where you can fish private and open waters with experienced local guides who will take you to the best fishing spots. We are also located within 25 minutes of 6 other salmon rivers. We work closely with 3 other fishing lodges having access to each other fishing pools. It is your chance to discover why the greatest baseball player - and one of the best fishermen of all time - Ted Williams, made this area his summer home for over 30 years. Your comfort is assured as the 4,000 sq. ft. log lodge consists of five bedrooms, 3 bathrooms,and a modern kitchen and dining area. The living room is spacious, with its cathedral ceiling and large windows offering a spectacular view of the river. Just sit back and watch the salmon jumping and rolling or let a gorgeous sunset complete your day. The lodge has been placed in a (FOUR STAR) rating category by (CANADA SELECT) the accommodation rating program in Canada. It shares the top spot in New Brunswick with only five other locations! We also offer packages for other areas in Newfoundland, New Brunswick, Labrador and Quebec. If you have a specific location in mind that is not mentioned above, give us a call - we'll see what we can do for you!